I want to find the chive rice cakes hidden away in Psar Tuol Tom Pong which are a favourite of Loung Ung and to dine on crabe farci (fried, stuffed crab) at Seng Lipp restaurant. I want to hang out at Battambang’s s riverside Balcony Bar and find Karen Coates’ favourite seafood restaurant in Kampot. I want to discover the little café near the airport with “the most amazing bowl of hot noodle soup”. And I want to find the lesser-known temples in Siem Reap where I can walk to the top of Phnom Bakheng to watch the sunrise and then have breakfast at Angkor Reach. "To Cambodia With Love" is a fabulous read for people visiting, living in or wanting to learn more about Cambodia. It's a patchwork of personal stories and fact, woven together by a host of esteemed authors who are familiar with the lesser-known areas of the country and who provide insights not usually given in traditional guide books. The stories and experiences described in the book are written by such authors as Loung Ung ("First They Killed My Father"), Socheata Poeuv (producer of "New Year Baby") and Phil Lees ("the unoffical pimp of Cambodian cuisine") along with a host of others who reveal their own personal favourites in the country they love. It's not just a how far/how much/how to guide - but rather a compilation of secrets and delectable bites from each author, giving the reader better insights and direction into how to find the real Cambodia. Not only do you learn how to order (and recognize) exotic fruits, where to find the best deep fried spiders and how to find a white-shouldered ibis, but you'll also learn how to behave at traditional weddings, what to expect at local festivals, how to find secret gardens and how to volunteer your services at charitable organizations. And, while the book includes travel information about the usual suspects (Siem Reap, Phnom Penh, Kampot and Sihanoukville), it also takes you to places like Sambor Prei Kuk, Kaam Samnor and Virachey National Park – places which are certain to dispute the cliché that “everything looks about the same in Camboda”. 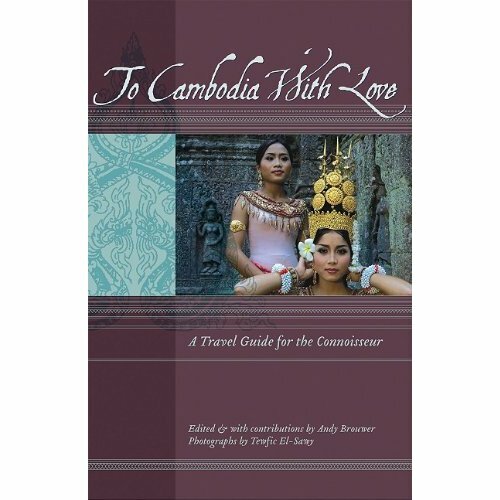 “To Cambodia With Love” can be purchased at Amazon and will soon be available at Monument Books on Norodam Boulevard.